When was the last time you truly felt like you could see clearly and speak up in your own unique truth? When was the last time you spoke up without questioning who you would offend? For years now, I have felt like I have so much to share, as a teacher and as a person. I have been given a plethora of life experiences at an early age and I know in my gut that this was no mistake. Yet for much of my life I was very scared, scared mainly because I was afraid of what others would think or say; scared that I might offend someone, that they might not agree and then as a result not like me. Those thoughts for years kept me from sharing my insight, thoughts, opinions and ideas. Even in casual conversation with friends and family, I would often do more of the listening and hardly any sharing because I didn’t want to be different, I didn’t want to make anyone mad. And when I knew I had a different opinion I struggled in holding onto my own truth. I would go home from those conversations mad at myself for either not speaking up or leaving my opinion beaten into something that I didn’t stand for. I didn’t have the backbone to be okay with my belief and being different than the rest. This people-pleasing mindset left me even more unhappy, even more angry, and irritated at the world. In reality, I did not know that this anger and irritation was really more about me… because I didn’t have the skills to speak up confidently without taking others actions and reactions so personally. I was mad at myself and projecting it onto others as their fault. Yoga has helped me a great deal with developing insight, and with insight you are able to see things differently, you are able to step back, practice compassion and at the same time, practice standing in your truth. Insight can be a tool to help you make changes in your life, but having insight doesn’t mean you are perfect and it surely doesn’t mean you never make mistakes. Before I was a bystander in my life, and now I get to be fully integrated into it. I’m constantly learning. I would often tell my husband how much I admired his abilities to tell it like it is, and not care. He would often reply back, “I do care, just not about everyone’s BS, I have my own issues. I don’t need to hear about everyone else’s.” He is always saying that when you are upfront right away about things, there is no guessing and less issues later (if you are wondering he does a lot of wheeling and dealing and is a business owner too). 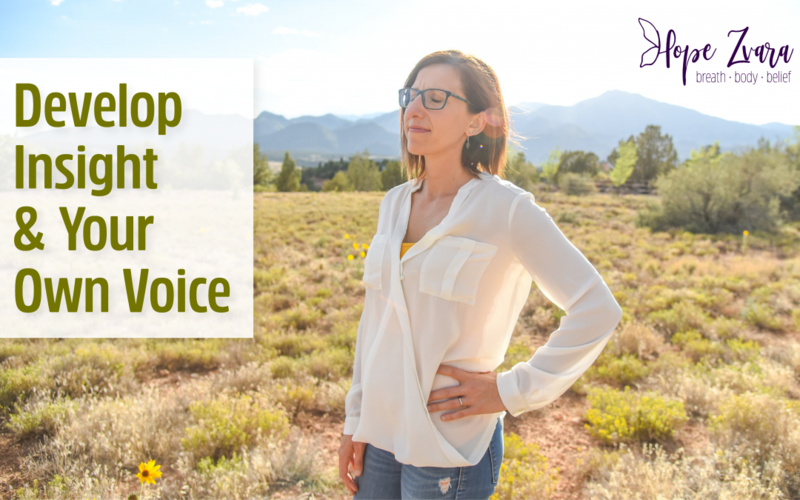 So how do you develop insight and your own voice? 1. Breathe more, talk less. Learn to focus on your breathing. Breathing keeps you in the present moment and helps you slow down. If you are not breathing then internally you are putting yourself in a position of anxiety and stress where it can be difficult to think straight and truly feel. So in those moments of truth and honesty, in those moments of both giving and receiving information slow down to breath more and talk less, this will help you feel and evaluate what you are going to say before you say it. 2. Think before you talk (or write). Get quiet and ask yourself, why am I going to say/write this? Who will it help, is it truthful and honest? I can’t count the number of times I write a comment on social media, type a reply to a video, email or go to post something myself only to delete it because when I reread and reflect I feel in my gut it’s not worth it and I’d be doing it for the wrong reasons. There are times to speak up and times to shut up. Privately practice getting honest with yourself, talk out loud to yourself, and practice speaking your truth (or writing your truth). In the beginning it may not be pretty, but as you gain better insight skills you will be able to tame and mold it. I have written countless blog posts, only to never publish them in fear someone might not agree, or might get angry or take it personally, this is no way to live. 4. The people you surround yourself with, are a reflection of who you are. Surround yourself with people that inspire you to be better, people that you want to aspire to be like, remember you become your company. Be in good company of people who have mastered the art of insight and speaking up, learn from them, even ask them questions, doing this has offered me some of the greatest insights and self reflection. 5. Speak up with safe people. Speaking up with people who you trust and people you can maybe even share what you are working on with. The only way to get better at riding your bike is to watch a YouTube video do it over and over again. 6. Practice NOT having the last say. 7. Remember, negative feelings pass. Start to sit with the uncomfortable feelings after you speak your truth and let yourself feel those feelings. Those feelings don’t last forever, but they do stick around if you continually avoid them. Being uncomfortable is a huge part of growth and a huge part of change. I see this often, people deflecting change by blaming others, or giving excuses for what they are not willing to address and take action on themselves. I have both been the target, and have targeted others due to a lack of skills and insight; the only reason I see this now is because I was the queen of this for many years. If you are a yogi, I would encourage you to consider a slower practice to help you learn to sit with the feelings more, feel them and let them pass. 8. Observe your body language, and tone of voice. Parenting is a great example. If you parent from across the room you can pretty much expect your child to never listen or take you seriously. Just as important, if you ask your child to do something or listen to you and you are requesting them to do so while scrolling on your smartphone, do you think they will take you seriously? If you don’t give them complete attention, why should others do the same to you? There are a million angles to take on this. Feeling inferior? Try sitting up tall, or uncrossing your arms and legs to help you receive better. Make eye contact when you talk and use inflections in your voice to stress importance in the conversation. These are all things I use in my personal life and when I teach to help students stay tuned in. 9. There’s always room for growth! No matter where you are in your life there is always room for growth and insight. I see now what I could not see before, that those who develop a sense of self, a voice and a truth are the ones who receive what life has to offer more fully, because the goodness that is waiting for them knows where to go and is then well received. When was the last time you spoke up for yourself? Be well, my friends. Namaste.